Night Flight Ornament | Painted Ponies Everyday Figurines | One Price Low Flat Shipping! 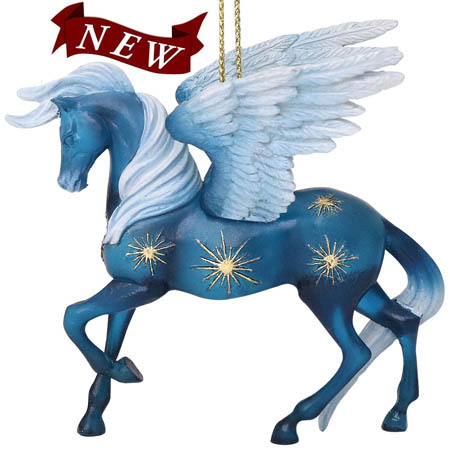 From the Trail of Painted Ponies 2018 Collector's Choice Ornaments Collection, Night Flight 2.5" Pegasus Horse Ornament. Designed by acclaimed equine artist, Audrey Dixon. Made of stone resin. Measures 2.5" tall. Packaged in collectible gift box. 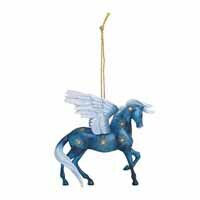 This beautiful blue pegasus horse has snow white wings and tail and is adorned with shimmering golden stars. Gazing on clear cold nights at stars and constellations shining brightly and beautifully is the most inspiring time of day for this artist. It is a time when she feels she is no longer bound by the restraints of earth, ideas appear out of the blue, her dreams can take flight, and as though carried on the back of a mythical winged creature, she is transported to lands where amazing adventures await.